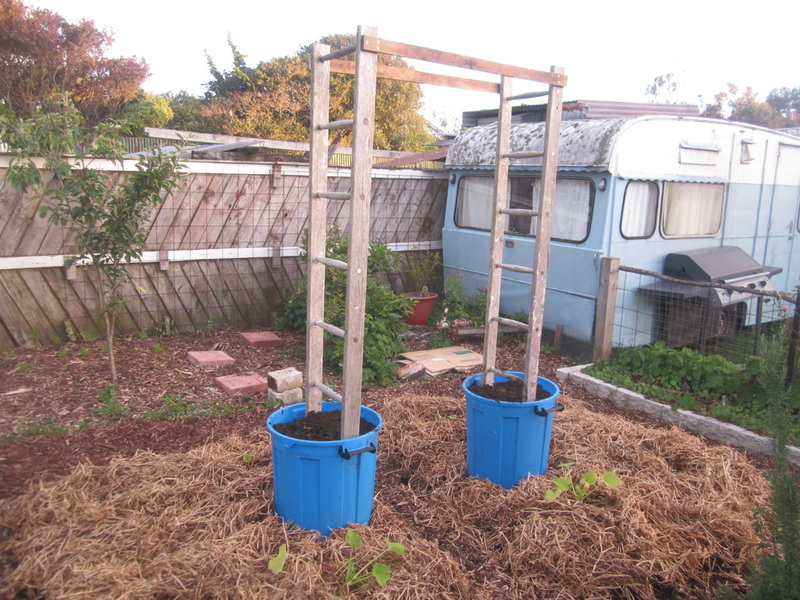 The entries you will find on this blog page are all from my original Kiwi Urban Homestead blog. In making the switch to Thrifty Kiwi, I've managed to bring all of the old entries with me, but due to the change in web address, any internal links within articles will no longer work. So, if there is something you're looking for, you will probably find it by using the Categories links on the right side of this page (under Archives). In time I may get a chance to work my way through these two years of posts and fix all the links, but life is very busy, so no promises for now! 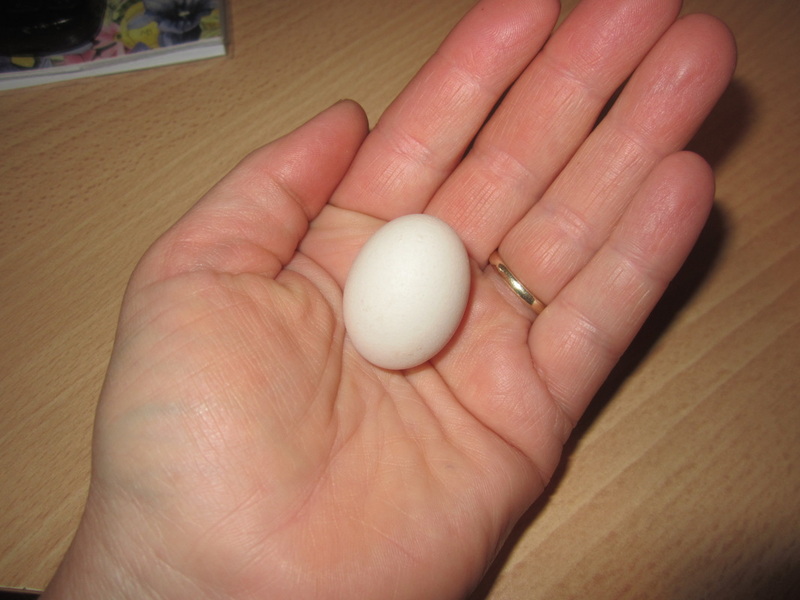 One teeny, tiny egg! And nothing else! :-) Oh, I laughed! Only 3 cm in length. 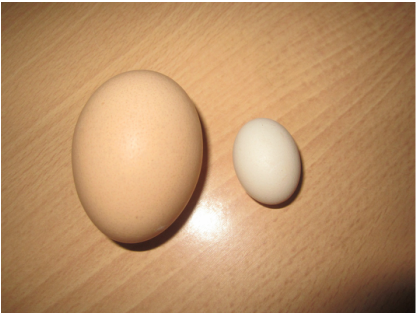 Below, it is next to a regular sized egg for comparison. 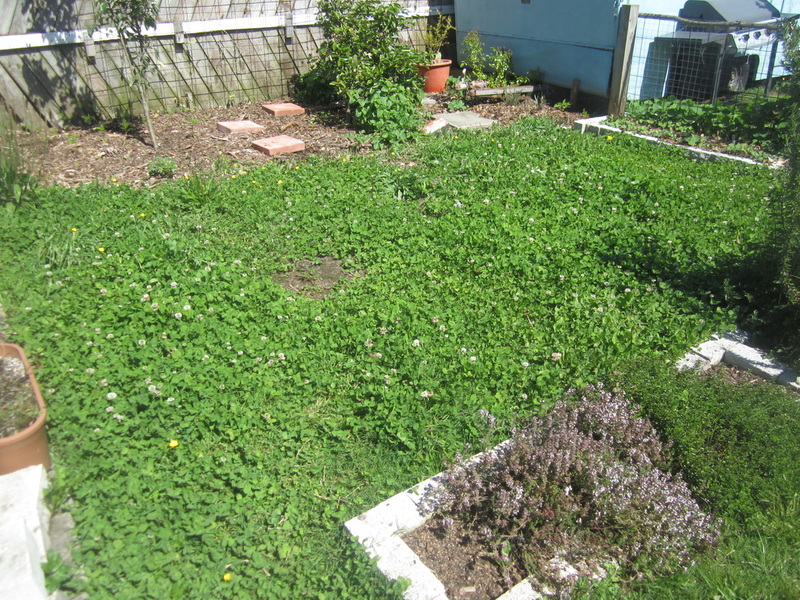 It started with this patch of clover - originally lawn 2 years ago, it had been turfed and dug over, and planted in yacon two seasons ago, and popcorn last year. It had been mulched with sawdust/horse manure from a local racing stables, which resulted in a lush growth of clover, which likes to grow where nitrogen boosting is needed. But I hadn't decided what to do there this year.....I had had a few ideas but discarded them for one reason or another. Now with this new scheme in my brain, I first mowed the clover, dropping it to compost in place. Then I started laying out cardboard, salvaged from the bins at the local supermarket, with all tape etc stripped off. 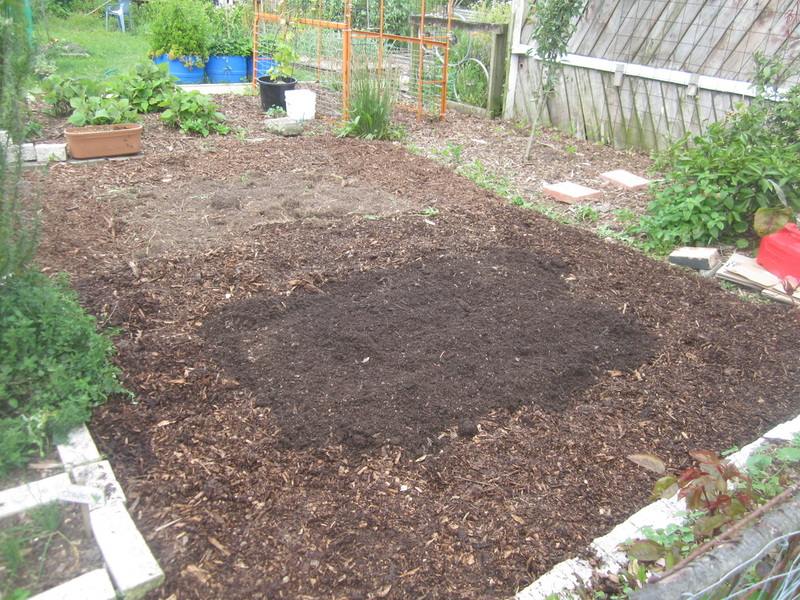 First I laid out one of the rectangles that would become a raised bed, wet down the cardboard, and spread some used compost from last year's potato bins on top. 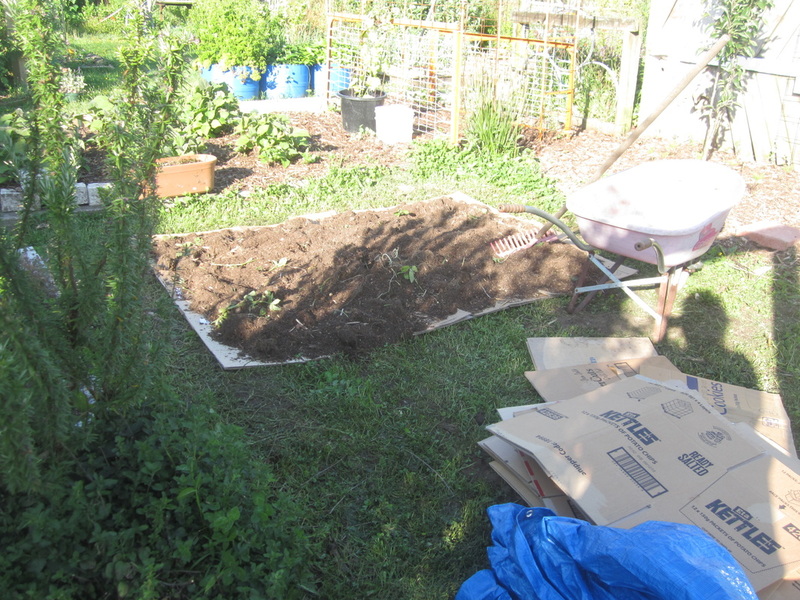 Then I continued to lay out cardboard until the whole area was covered, with spent compost where the two beds would be, and bark mulch around the outside and through the middle for paths. Next, I went and mowed some lawns, and spread the clippings over each bed. I took two 60 litre rubbish bins, and drilled 10mm holes in the sides just above the base all round, then positioned them opposite each other each side of the path, on the beds. I temporarily placed a large brick in the bottom of each to stop the wind knocking them about. I added more layers to the beds with some fresh home-made compost, and a sprinkling of various goodies I had in the shed - sheep pellets, rock dust, quick and slow release vege foods. 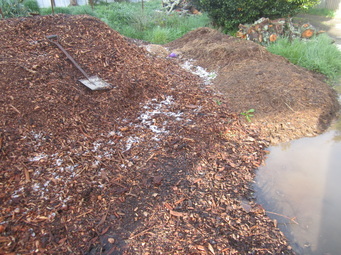 Next a layer of almost completely composted woodchip. 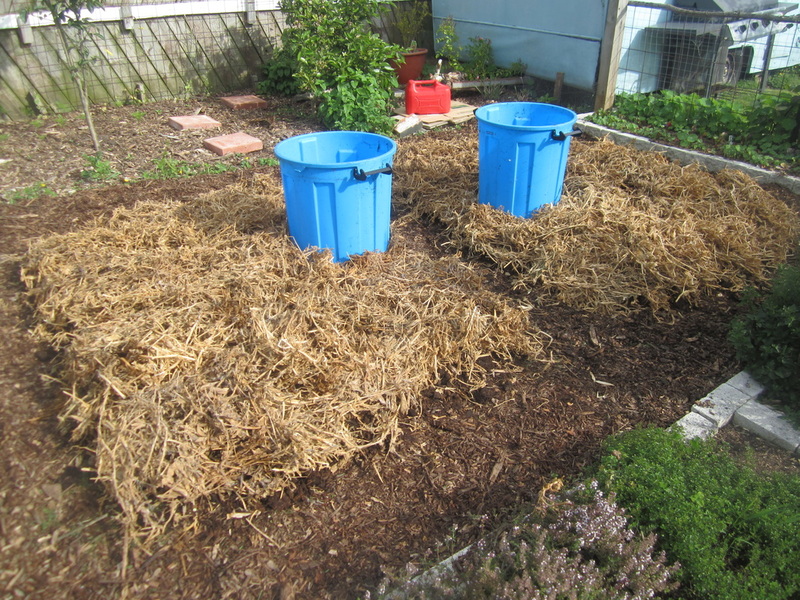 And then I covered both beds with some left over pea straw. I had a old 4m wooden ladder a neighbour had given me. My husband and I cut it in half and evened it out so each half had a rung the same distance from the top. We placed each half upright in a bin, and secured them across the top with two pieces of scrap wood. 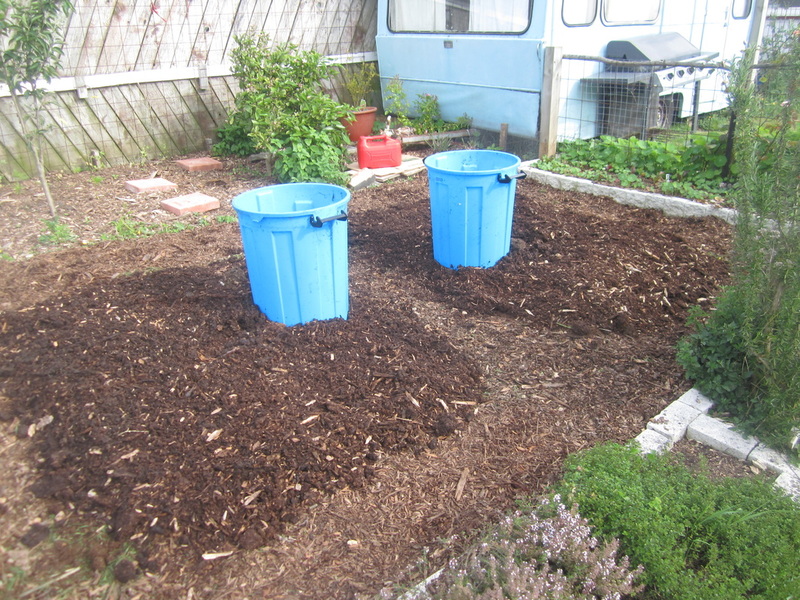 I filled each bin 3/4 full with incompletely digested compost. I planted four zucchini plants in each bed. The idea of the bin with the compost and the holes is that I can water the zucchini by putting a hose into the bins, which will dissolve compost and water it out through the holes, watering the zucchini with compost tea (feeding them at the same time) as well as avoiding wetting the leaves (reducing risk of fungal infections). 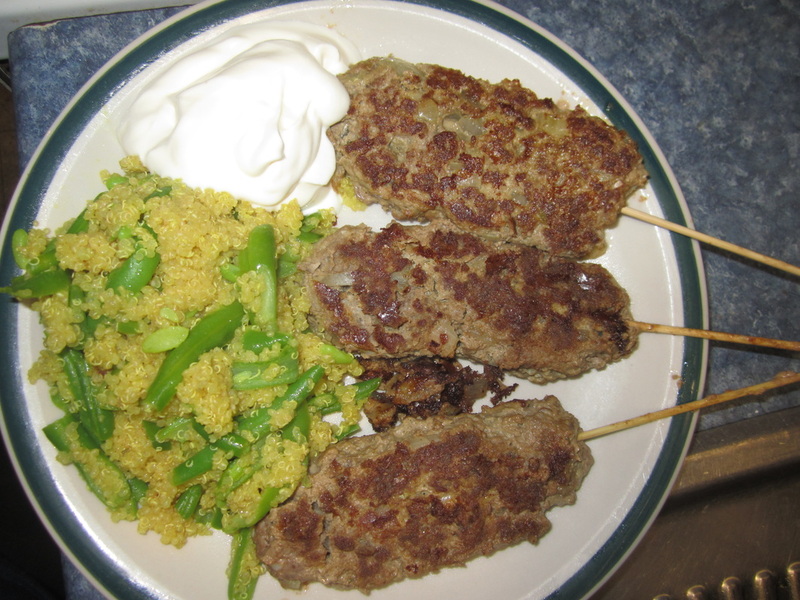 I made this delicious meal a little while ago with our home grown lamb. Some of the mush and salad ingredients were home grown too; more could have been if it was a little later in the season. I was once again instructed and inspired by Italian chef Cesare Stella! 1) Make Salmi Paste: toss the following into a food processor, then process and set aside: a handful of walnuts, 2 anchovies fillets, a handful of Kalamata (pitted) olives, half a handful of capers, 6 garlic cloves and a handful of parsley. 2) Brown lamb shanks: Place lamb shanks in an oven tray, sprinkle with salt and lightly coat with olive oil. Brown them in oven at a high temperature on all sides. Turn oven to medium. 3) Add to the lamb shanks: a sprig of rosemary, and chopped carrots, garlic, celery and onions. Drizzle with a little more oil if needed, and toss with the shanks. Return to the oven for 10 mins, turning frequently to prevent burning. 4) Add liquids: Remove tray from the oven, add a splash of white white and a ladle each of vege and chicken stock. Cover and braise for at least 2 hours, check and turn the shanks every 30 mins, ensuring they do not dry out. 5) Make Salmi Sauce: when the shanks are done (meat is falling off the bones), place the shanks on plates. Scoop out the vegetable with a slotted spoon, then put the remaining liquid into a pot. Mix in 2-3 TBSP of the prepared salmi paste, and bring to the boil. It should thicken up, but if needed add a little cornflour paste (this does tend to cause the mixture to separate rather than remain smooth though - still tastes great). 6) Drizzle the sauce over the shanks, and serve with mushed roast veges and a fresh salad. I prepared the roast veges ahead and set aside. When they were cool I pureed them, and when the lamb shanks were almost ready, I created the final dish. In a large roasting tray, toss a selection of prepared veges in a little olive oil. I used potatoes, pumpkin, kumera, onions - the more variety the better. Roast at 180C until tender. 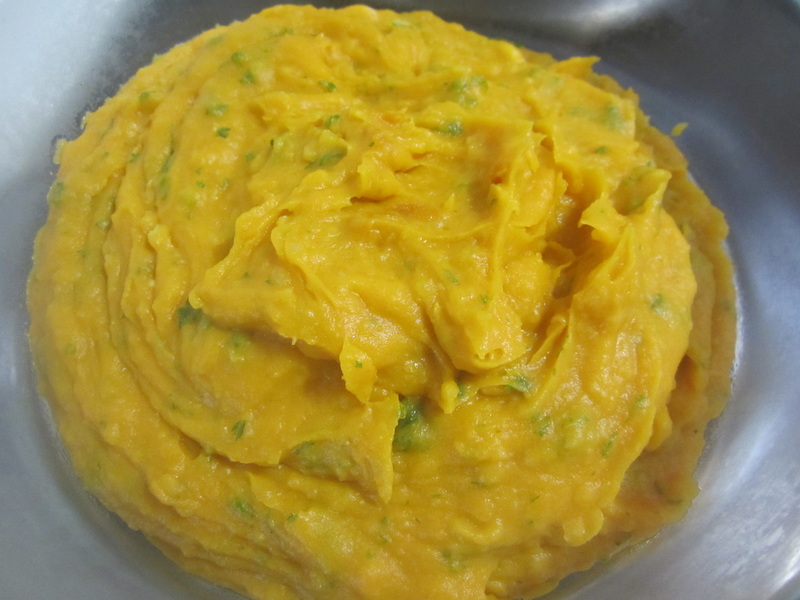 Place veges in a food processor, and process until smooth. Shortly before serving, saute in a pot some chopped garlic, chopped parsley and ginger. Add the vege puree, a bit of olive oil, and a bit of rice milk if too dry. Bring to a simmer and taste for seasoning. Make up a fresh salad with ingredients of your choice. I placed a selection of salad greens in a bowl, added a layer of chopped cucumber and a ring of tomato segments. I sprinkled it with calendula petals and garnished with pansies. Both types of flowers are edible. Yesterday, an Italian chef with a restaurant in Northland kindly offered on the NZ Vege Gardeners Facebook page to share his knowledge with anyone wanting ideas of what to cook with ingredients from their garden. Inspired by his suggestions when I posted a list of homegrown ingredients I have to hand right now, I just made this delicious dinner! Thanks Cesare Stella! All ingredients except fish, bacon, coconut & olive oils, nutmeg and salt were from my garden. 1) Turn on the oven to 180C then make a quick trip out into the garden with a basket to pick some Ruby Chard leaves, sweet-leaf fennel, parsley and chives. 3) Chop pumpkin into chunks, removing the skin. Place it into a lidded casserole dish, sprinkle with Himalayan mineral salt, and add 1/2 cup water to steam it. Cover and place in oven. 4) Peel all the garlic cloves, then toss in a little olive oil to coat. 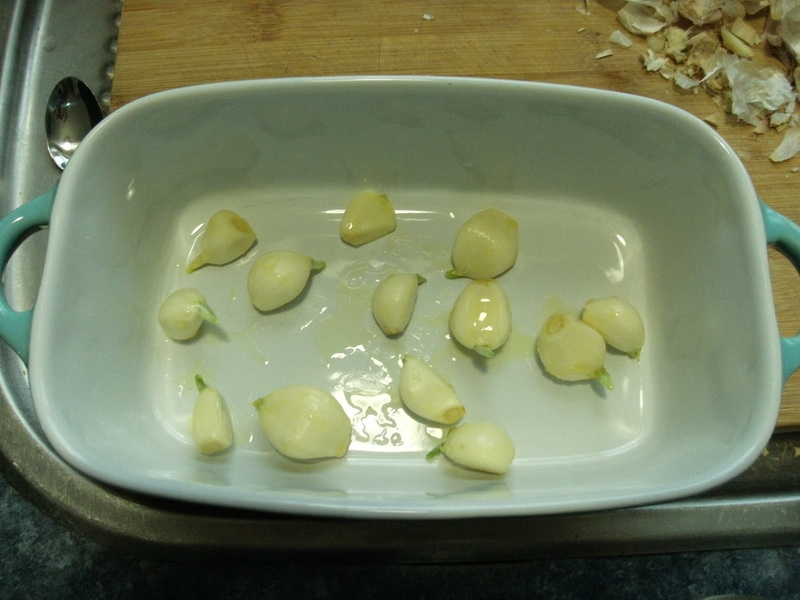 Place cloves in a small oven proof dish and set aside. 5) Wash the chard. Cut off the ends of the stems, then cut the stems from the leaves just below the base of the leaf. Bag the stems and refrigerate to be used in a soup another day. Taking leaves 2 at a time, cut them down the centre in the direction of the stem, then slice in the other direction into segments about 1.5cm wide. Place in a large bowl and set aside. 6) Wash fennel and shake off water. Remove fronds from stems. We're just going to use the stems. This is sweet-leaf fennel which doesn't form a bulb. 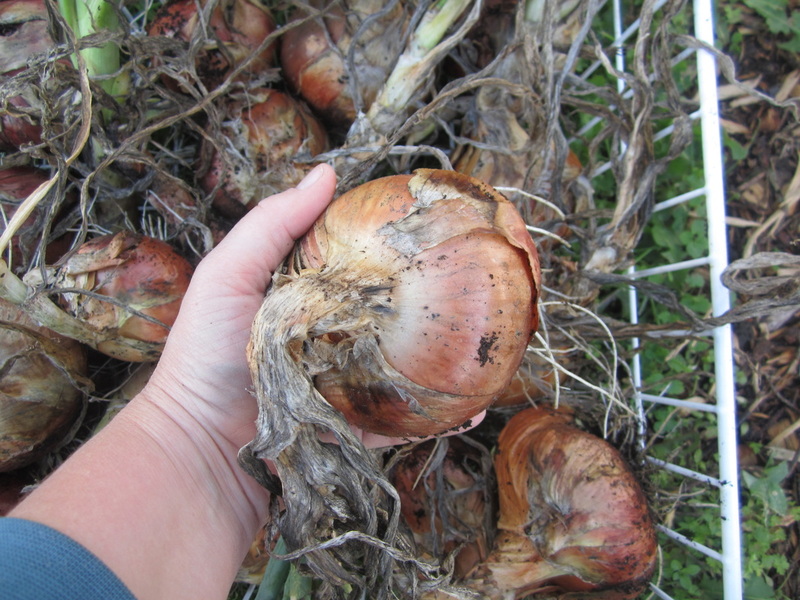 If you have bulbing fennel, slice some bulb up instead. Chop the stems into small rounds and set aside. 7) It's now time to pop the garlic into the oven beside the baking pumpkin. Be sure and shake the dish every few minutes to cook evenly without burning. When golden and tender, remove the dish from the oven and set on stovetop for now. 8) Wash the parsley. Decide you've picked too much, so eat one head. Finely chop the rest of the parsley, discarding stems. Realising you've got too much for this one dish, spoon the extra into an ice cube tray, tamp down lightly and cover with olive oil. Freeze. These parsley and oil cubes can be added to future dishes. 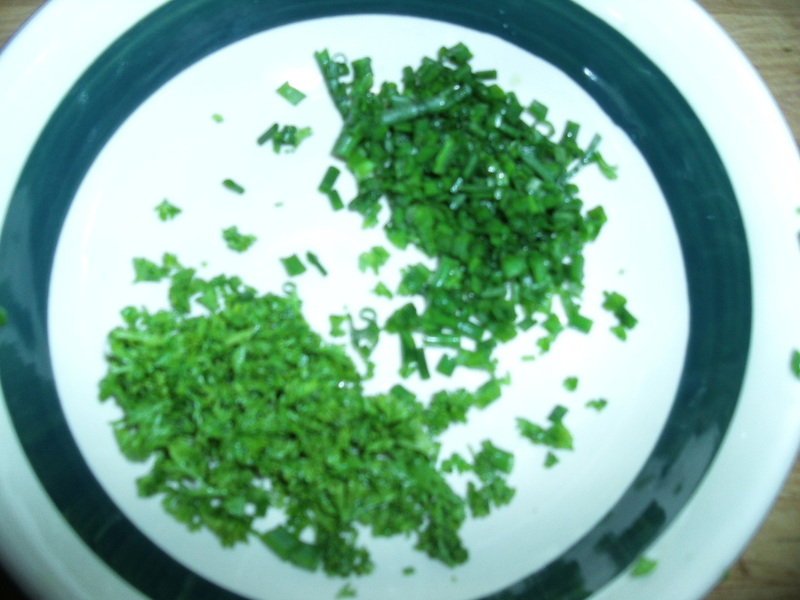 Meanwhile, set aside the remaining chopped parsley in a small bowl. 9) Wash and finely chop chives. Add to bowl with parsley. 10) Remove one piece of bacon from the fridge. 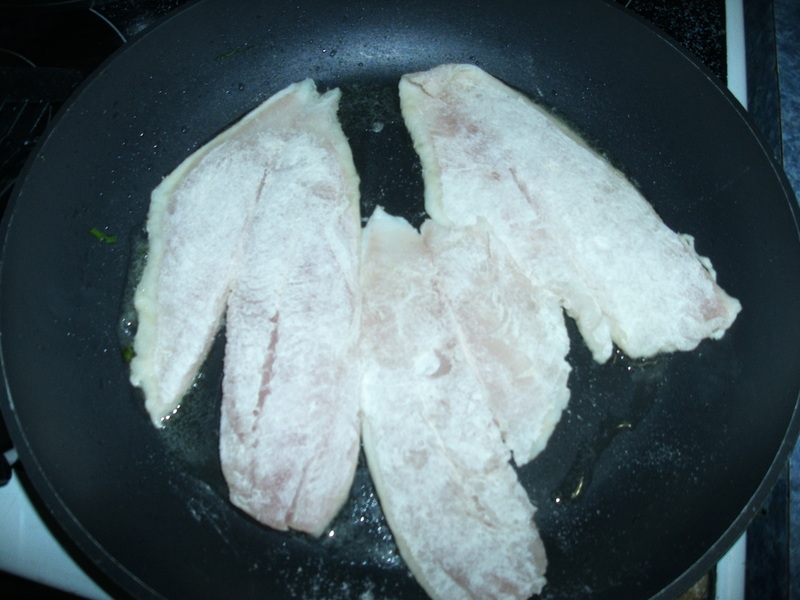 11) Remove packaging from Tarakihi fillets, and coat in brown rice flour. 12) Check on the pumpkin. If it's tender, remove from oven, set aside, and turn oven off, leaving door ajar to cool a bit. 13) Pause in cooking to feed the dogs and cats and get them out of my way. Wash hands. Now we're about to start the real cooking - and you've got to move fairly quickly - this is why all the chopping and prep is already done, so you can simultaneously cook two fast dishes! First, pop the pumpkin and garlic back in the oven to keep warm, and put some dinner plates in there to warm too. 14) In a large pot on the stove, melt some coconut oil. Add the slice of bacon, turning as needed until cooked. Remove bacon to a plate, and chop it up. 15) At the same time, in a large non-stick frying pan, saute the fennel in some melted coconut oil until tender, then remove from pan and set aside. 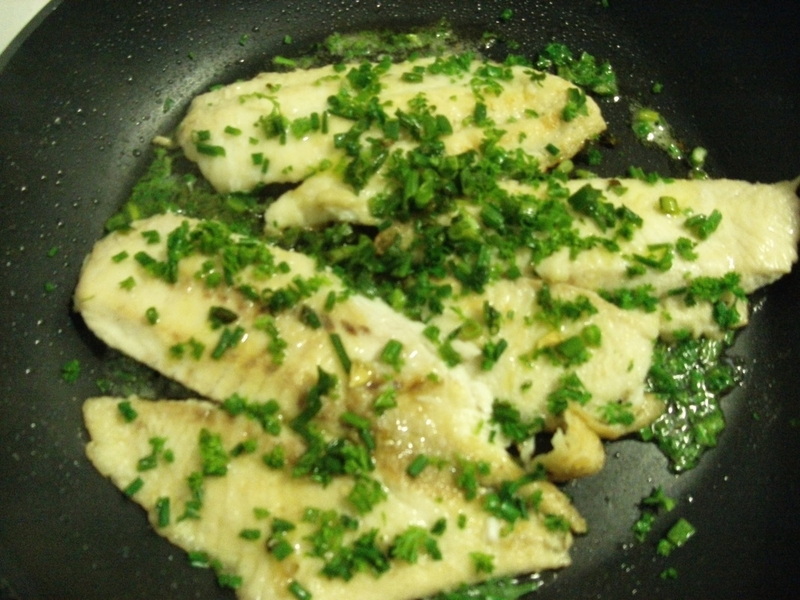 16) Place the fish fillets in the frying pan to begin cooking. 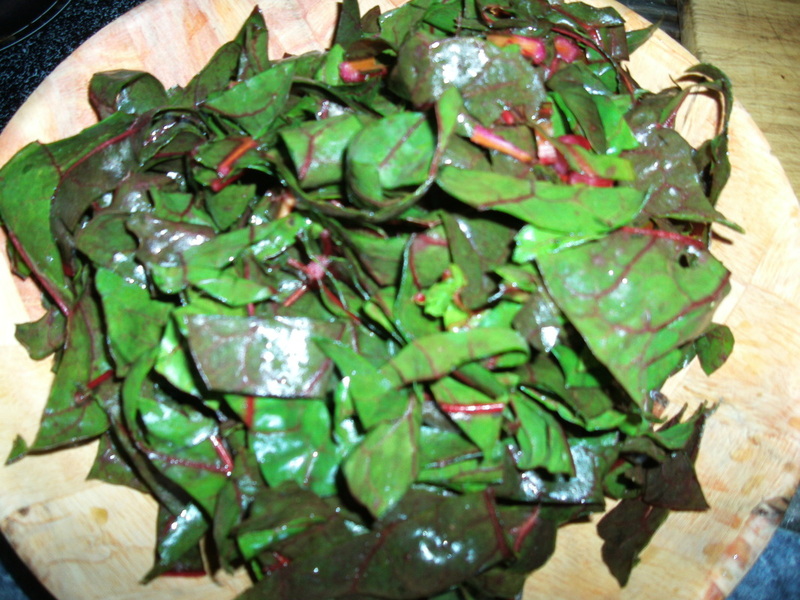 17) Now add your bowl of prepared chard to the large pot - the moisture clinging to the leaves from washing it will be all you need to steam it. Sprinkle over a little quality salt, toss in the chopped bacon, give it a mix up and put the lid on. Steam over low-ish heat until tender then remove from heat. 18) Meanwhile, the fish will need carefully turning over. Once just tender, add fennel, parsley and chives to the pan, squeeze over the juice of half a lemon fresh, and drizzle with olive oil. Remove from heat. 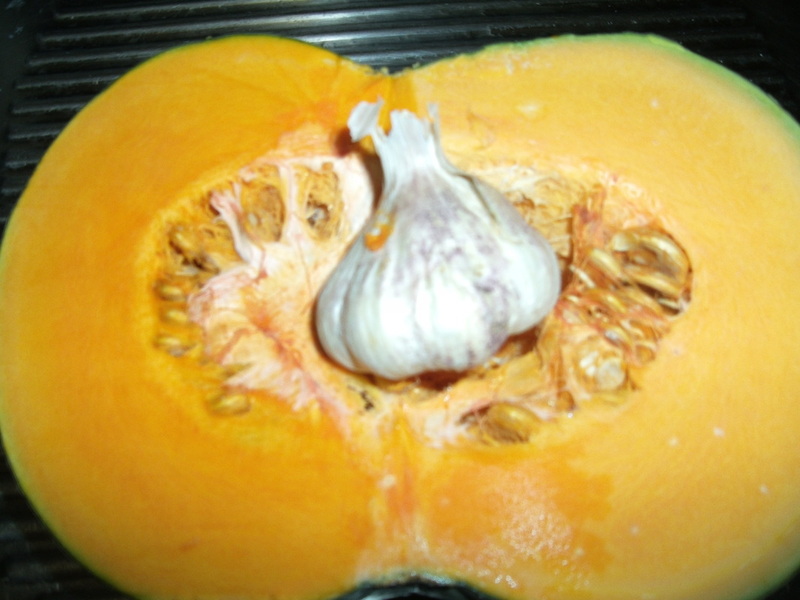 19) Roughly chop the roasted garlic, add to the cooked, drained pumpkin with a sprinkling of nutmeg and mash. 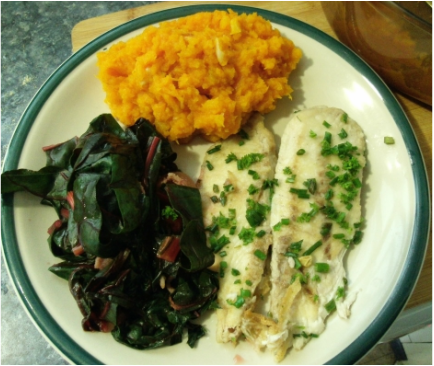 20) Carefully lift a fish fillet onto each plate, add a serving of chard & bacon, and mashed pumpkin & garlic. Enjoy! Last summer I decided to conduct an experiment in my greenhouse, to see which varieties of tomatoes would grow and produce best, and in which of 5 growing mediums, in response to lively discussion on a Facebook group I am part of. I carried out the experiment, but was rather remiss about actually publishing the results, so here I will link each of the YouTube videos, plus add the results and my comments, so it's all in one place. If you are just after the results, scroll down. I actually ended up sending an email to the company that produces the potting mix and compost, and as a result had a visit from one of their regional managers, who was interested to see what was going on. By the time he visited, the plants which were in the compost, which had initially done much better, were slowing down somewhat, and the plants in the potting mix, which seemed to have deficiencies at first, were doing much better. 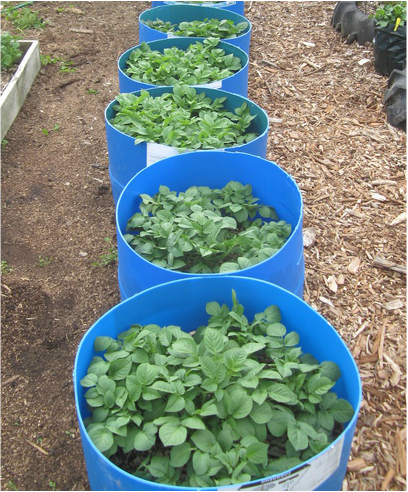 This is logical when you think about it - the compost provided initial burst of nutrition, which then got used up, while the potting mix contains slow-release fertilizers, which took a while to kick in. A note regarding feeding the plants - initially I started off feeding the plants with fish suspension liquid, and then later some worm tea and/or Seasol. Anytime I fed them, I fed all of them the same. However I did not continue this regime for terribly long - getting too busy with other things. Obviously, if I had consistently fed the plants, they would likely have produced more than they did. But either way, they all got the same treatment, so for purposes of comparing growing mediums and varieties, there are still things we can learn from this very unscientific experiment. The main results I was looking for were actual tomatoes produced. So, as I picked each time, I weighed the resulting fruits and wrote them down under the # of each bucket, and at the end collated the results. I'm going to group the results two ways - first by variety, and then by growing medium. Weights given are in kilos, and are the total harvested weight from the given plant in that bucket. The easiest way for me to do this is to create tables in Word then import them as images - apologies if they are a bit fuzzy. (I) stands for Indeterminate variety - keeps growing like a vine. (D) stands for Determinate variety - grows into a bush, produces, then dies off. 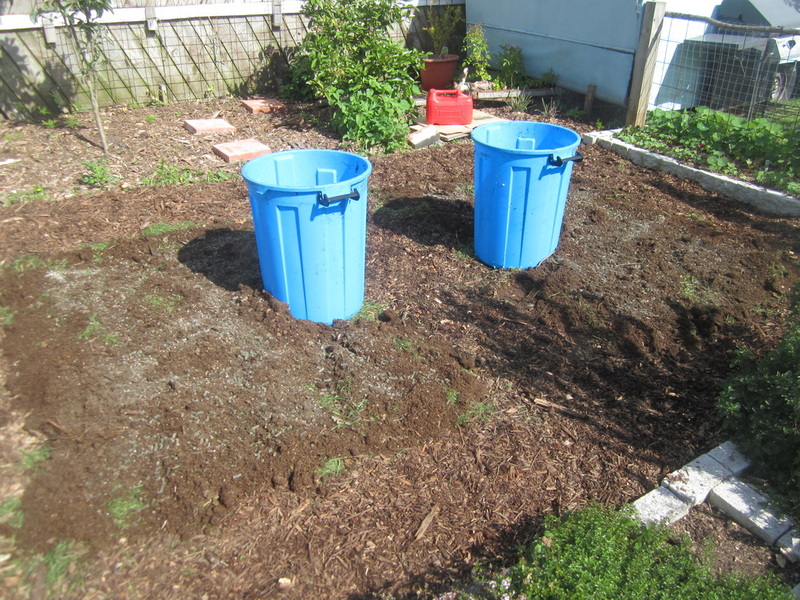 For this last set of buckets, a thin layer of topsoil was placed in the bottom of the bucket, then 1/2 the bucket was filled with fresh sheep manure, and the top 1/2 with compost. What conclusions do I draw from this experiment? Well, on the face of it, straight potting mix produced the most tomatoes, after a slower start, with straight compost not far behind. If the Roma in potting mix hadn't died, there might be a bigger difference. No matter what growing medium one uses, though, consistent feeding over the life of the plant is the key to maximum returns! Of course, one can't really draw final conclusions from this little experiment - to do that, one would need to grow more plants of the same variety in each growing medium, and have some in different conditions (eg outside as well as in the greenhouse). What am I taking away from this personally? I won't be growing Roma or Silvery Fir Tree varieties again. Moneymaker is a good, reliable producer, but needs proper trellising set up to support it, and regular pruning/training. I don't personally like Box Car Willie as I don't like big, beefsteak type tomatoes. I do like Tigerellas, a stripey heritage variety, but again they need good trellising. Growing in the greenhouse for some reason (possibly the very high temps at time) prevented the plants from getting infested with tomato-potato psyllid, which devastated my outdoor plants. This summer I think I will grow just 2 Moneymakers in my greenhouse, in bigger pots filled with a quality potting mix, with better trellising and regular feeding. I will also grow some more smaller pots of determinate varieties Tiny Tim and Sub Artic Plenty. If I grow any outdoor tomatoes, they will have to be carefully covered in micro-mesh to keep out the psyllid. And maybe I'll also experiment with some other varieties. After all, where's the fun in gardening without some experimentation with new plants and/or ideas?? I love growing our food and providing for my family. But we also need to make some other changes, as my husband and I need to lose weight, and we and our three girls still at home all want to improve our health. This past six months I have been SO busy that I've slipped into worse habits than usual, and have put on a few extra pounds. Enough! This past week I turned 45, and we celebrated our 26th wedding anniversary. I determined I would change before I was 40, but time has slipped on by. Now, we're grabbing the bull by the horns, and making changes as a family. After watching That Sugar Film and reading Wheat Belly and Trim Healthy Mama, we've decided to start by going sugar and gluten free. Here's to growing our own healthy food, and being healthy for life! I just read this really good blog post on how you can get started (or continue) homesteading even if you don't have a spare cent to your name. So many of the things suggested reflect what we have done or are doing here. Kendra does a great job of telling you the four (free) things you need to homestead without financial resources. 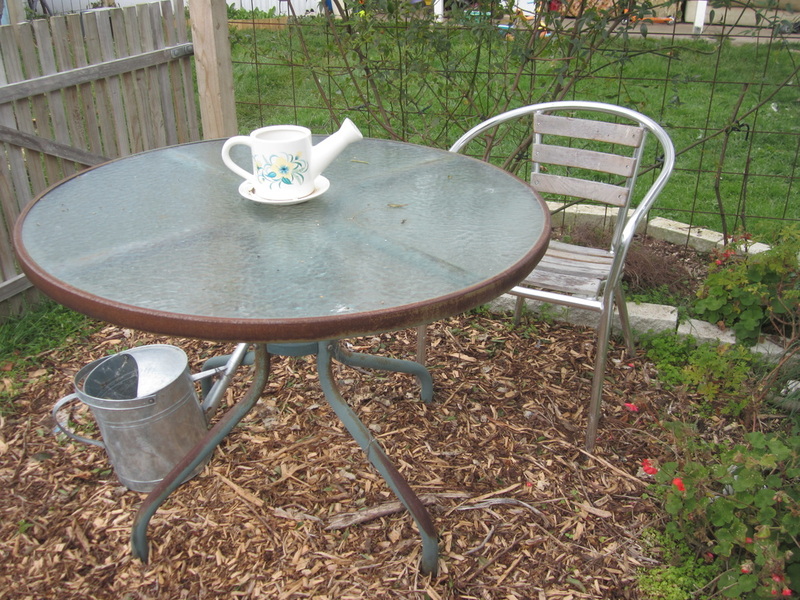 Hop on over to her blog and read her inspiring article HERE, and then come back and check out my own list of some of the ways I've been able to find free resources or create garden structures for free, or with very little expense, below. Free Punnets, Seed trays & Plant Pots: When you're starting a garden, seed trays, punnets and plant pots are really useful, but if you're gardening on any kind of real food growing scale, they can add up to a lot of money. Sure, there are a lot of things you can sow direct into the garden, but many crops do better if started in trays or pots then planted out later. Fortunately, many, many people buy seedlings and plants from garden centres (they must do, or they wouldn't still be in business!) and then after they've planted out the plants, they're left with all those plastic punnets and pots. What happens to most of them? They end up in the landfill! I have collected used free pots, trays and punnets from the local dump, from the free bin at local garden centres, and by letting other local gardeners know I'm happy to take pots off their hands. Once, I scored a van-load of pots when my son happened to be at the dump and spot someone about to unload them into the pit! I was able to share them with other new gardeners. Some of those pots and punnets are pictured below in this pic from our new greenhouse, which was built with recycled windows. Freezer baskets - so many uses! I've scored quite a number of old freezer baskets from the dump, and they have a lot of uses. In the greenhouse, I mounted two on slides made from pieces of corner moulding to create drawers which hold my smaller pots under the bench, and used a couple on the floor to stack a selection of punnets and small pots in. I also use more baskets to hold small to medium sized pots of plant varieties - this makes it easy to move a group of them in one go by simply lifting the basket. 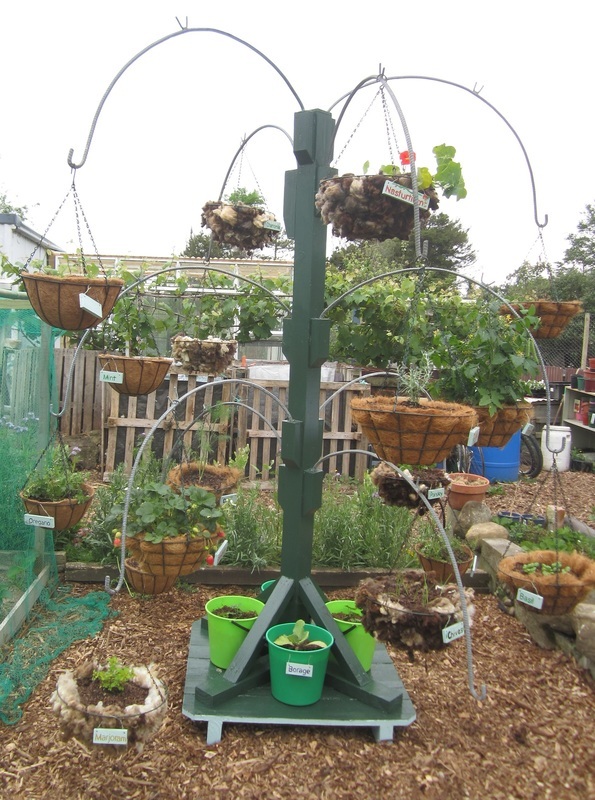 I have also used freezer baskets in the garden upside-down over young plants to protect them from birds who like to dig them up until they get established. This was especially useful for my watermelon plants this past summer. Freecycle finds: In the past year, I have scored from Freecycle the stainless steel bench/sinks unit used as a potting bench in my greenhouse, a load of brand new bricks used to create garden edging, and a kennel for our dog. Freecycle has regional groups throughout NZ - you sign up to receive emails of things listed by members, and you can list items wanted or to give away. A great way to keep good stuff out of landfills, and to share unneeded items with others. Wooden Pallets Untreated wooden pallets have so many uses on the homestead! 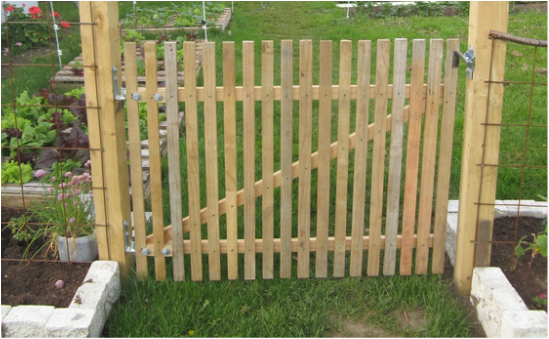 I have used them to build a fence and gate to keep the critters from the garden, make pallet beds for growing salad ingredients, and to build compost bins. They can also be carefully dismantled and the timber used to make other things. There are tons of cool ideas on the internet for things made with wooden pallets, from garden seats to sheds and houses! To find wooden pallets, ask companies that ship lots of stock on pallets. They will likely have some that have to be returned or they get charged money, but also often have unmarked ones they're happy to give away. You want unpainted, untreated pallets for food growing uses. Plastic drums 200 ltr plastic drums, which diary farmers have a constant surplus of, also have multiple uses around the homestead. The farmers can return them to source for recycling, but they don't get any money for doing so, so are usually happy to give them away if you ask nicely. I prefer the ones that have only had iodine teat-wash in them. 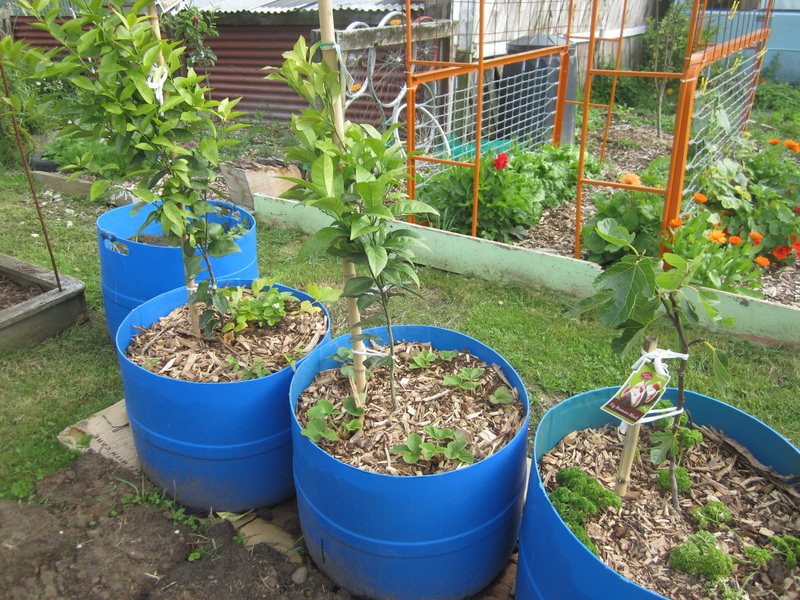 Cut in half and washed out thoroughly they make excellent planters for small or frost tender trees (as they can be moved to shelter in winter) or for growing potatoes and other crops. 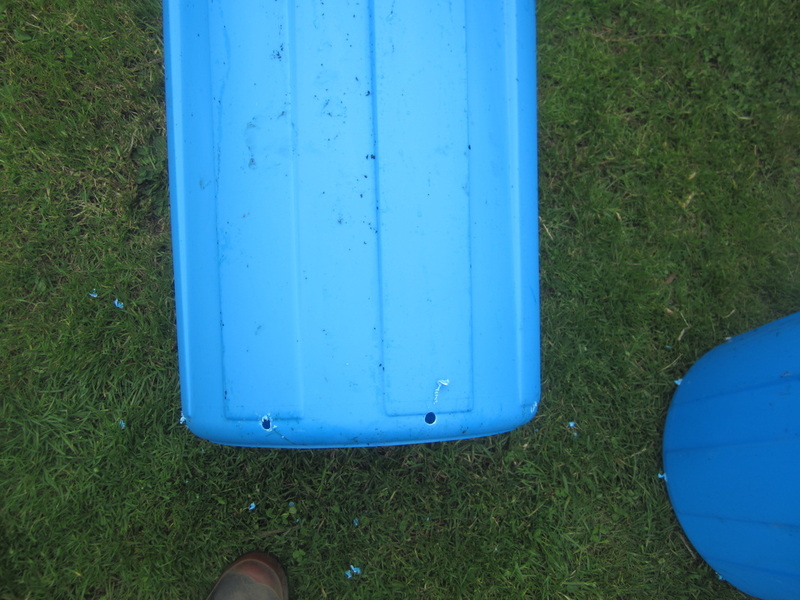 Whole drums can be turned into rainwater storage, and a drum minus it's lid is great for brewing up liquid manures and teas, or laid down and stabilised makes a great shelter for small animals such as ducks and dogs. Tyres Tyres are expensive to dispose of, so easy to get for free, but for this reason I advise caution against acquiring very many of them. There is a lot of dispute about toxins leaching from tyres; my own conclusion after much reading is that there is unlikely to be any significant leaching from tyres that have done high mileage, and that are whole (rather than shredded such as for recycling). However, I do prefer not to grow food crops in them. It is also important to be aware that tyres will heat up and dry out soil contained in them in summer weather, and that the shape of the tyre can cause plants to grow a circling root system that stunts the plant. Therefore, I have my husband cut off the lower wall of the tyre when I am using small ones to plant things like wormwood or small bushes within, giving the roots more freedom, or the upper wall when I want to use a large tyre as a planter. I've used a row of tractor tyres to create a visual and physical barrier between the parking area of our driveway, and my front garden. Planted with carpet roses and alyssum they look pretty and attract bees and other beneficial insects. Tyres are free for the asking at tyre shops. Garage Sales and Thrift Stores are a great source of free or very cheap items that can be used in the garden. I've collect lots of goodies by keeping my eyes open, including a wire mesh harvesting basket that cost me $3, lots of preserving jars for very little (I don't like to pay more than 50c each), a free swing seat (we painted it and sewed a new seat), various baskets I've used for planting with lettuce or for picking and harvesting, inexpensive garden tools, cheap pots, watering cans and more. Sawdust mixed with horse manure and urine - local stables clean it out of the stalls and pile it up, and let me bring home as much as I want. I've used it as a mulch, a compost ingredient, or just piled it on top of cardboard to create a new garden area from lawn. It breaks down into really nice soil. Pine peelings mixed with calf manure - the local dairy farmers clean out their sheds once a year, and are happy to give it away. I haven't found this to be the best source or materials though - I mostly use it for extra carbon in compost piles, or on pathways. Dead leaves - these are the most fantastic compost ingredient or mulch. I visit local streets where thick layers of leaves fall in autumn and bag up and bring home as much as I can. I reuse animal feed sacks or plastic bags, and then use the stockpile as I build compost piles. My worm bins enjoys a generous covering of leaves too. Cardboard and newspaper - local supermarkets and stores have and endless supply of cardboard and newspapers. I use thick layers to suppress weeds when building new beds, or to start lasagne beds, or on pathways before covering with woodchip or other materials. Shredded paper is also a use compost ingredient, though I also use office paper that has gone through my shredded inside - avoiding glossy papers and inks. Pine needles - local forestry plantings have thick layers of pine needles just lying around - I collect these and use them to mulch my berry beds, which thrive as a result. They can also be used to mulch pathways, in compost etc. Wood chip - wood chip is to me THE premiere garden mulch and material - it's whole shredded trees, including leaves, bark, timber etc. It improves garden soil like nothing else. For the real low-down on woodchip, watch the free movie at www.backtoedenfilm.com. Local contractors who prune or clear trees from roadsides etc, and then shred them are the best source. Some will drop a load off for free. Others have wised up to the value of this great material, and will deliver it for a donation of beer for their social club. Get to know your local dump or transfer station operators! People throw away so much good stuff, and it's amazing what you can find! I've sourced free paint to use on various projects, complete greenhouse frames with shelves which I've used as shelving in my greenhouse, and to create a unique climbing structure for the garden, and old bathtub which became my new worm farm, steel mesh which makes awesome trellising, an outdoor table and chairs, and old plastic table which I use as my outdoor plant station for hardening off plants, loads of garden pots, good tools, a sink which I turned into a planter, gates and bed bases I've turned into trellises, metal trays I use to hold pot plants, wooden pallets and so much more! 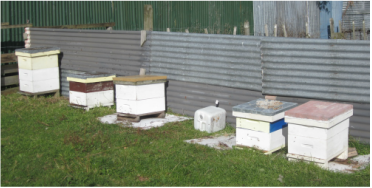 Free Bees & Honey - We've even managed to add beehives to our homestead without expense - our first two hives were given to us by a neighbour who was moving away, whom we had helped out from time to time. When one of those hives swarmed, we captured the swarm, which gave us three hives, and after splitting the queen cells from the brood and bees left behind by the swarm, our numbers increased to six. We have all the honey we can eat, and then some, increased pollination, surplus hives to sell and the proceeds provide more gear as needed. Free ducks, chickens, sheep and worms - I read on Facebook that a couple in a nearby town had too many ducks and were giving some away, and that's how I added David, Delilah and Jemima to our homestead. A few months later, Delilah hatched out 12 ducklings, and our duck flock grew. They are terrific at getting rid of slugs and snails in the garden, and fun to watch splashing in their pools. And they produce eggs and meat. We also started our chicken flock with chicks we were given for free. The great thing about livestock - once you have them, they multiply for free, if managed properly. I started my worm farm with an icecream container of worms supplied by the local librarian. Our sheep flock did take a small investment in the first 5 lambs, and later a ram, but I haven't paid for a sheep, or lamb/mutton to eat in the past 5 years. Neighbours with unused land have provided extra grazing, and in return our livestock keep their sections tidy. 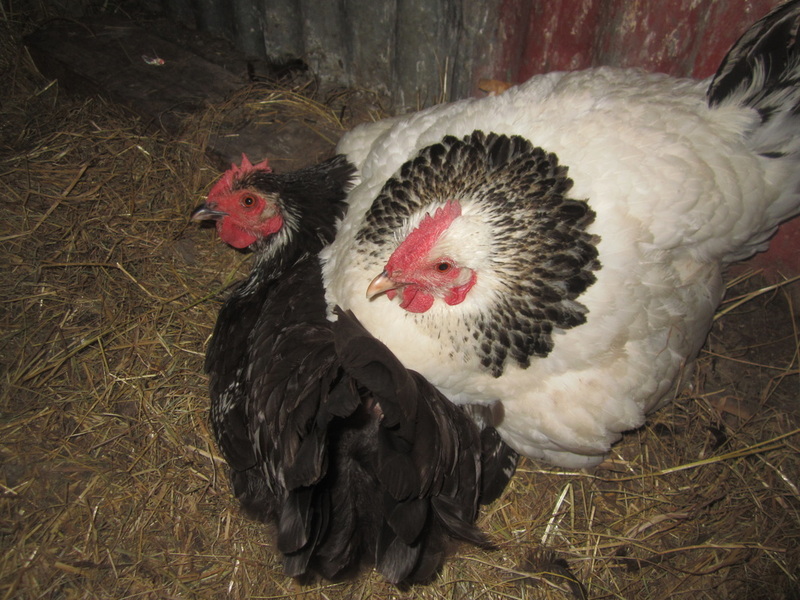 Animals are a real blessing on the homestead - providing so many useful resources. What's lying around? 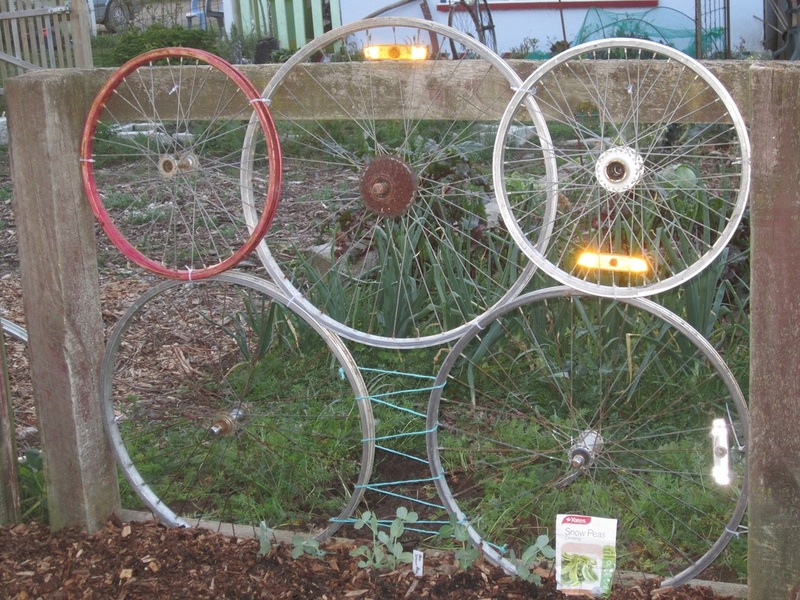 Your own property probably has all sorts of odds and ends that can be upcycled in the garden, and your neighbours might have things they don't use they'd gladly give you. How about scrap materials from the work sites of family members? 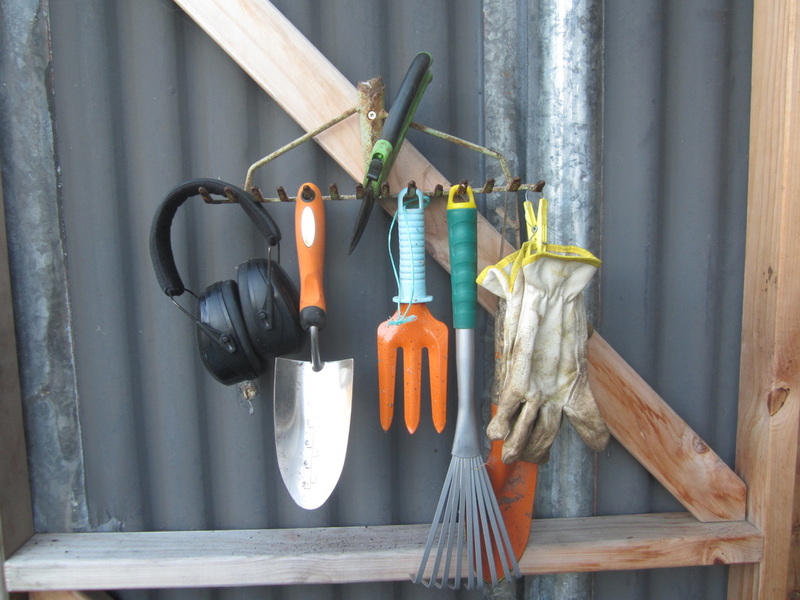 We used an off-cut of trailer panelling to make a whiteboard in the greenhouse, free scrap wooden slats from a building supply company to build a gateway to the garden, a broken rake to make a holder for my small garden tools, a pallet stood upright in the shed holds my rakes, loppers, hoes and other tools, left over iron from re-roofing projects (ours and local friend's) to make animal pens and shelters, fences and more, driftwood from the beach and branches from forests to create garden edges, a pile of old concrete house piles I found lying in a corner were used to create a raised platform in my garden where I located the swing seat, trellises and yummy food plants, and old bike wheels make great trellis structures. Bamboo a local was cutting down has been stockpiled and has endless uses for building structures & stakes. Enter competitions - you can win all sorts of free gardening goodies! My daughter nominated me for Gardener of the Year my very first year gardening, and I won the Best Vege Gardener section, which came with all kinds of goodies including gardening books, gloves, tools, planters, fertilizers, seeds, bulbs, and subscriptions. This past spring, I joined in the Yates Spring Vegie Challenge, and won some neat prizes in some of the smaller challenges along the way, including for my Herb Tree, which was made with materials I found at an op-shop, and things I had lying around. These events have landed me in the local papers several times, which has led to speaking engagements - and in return for telling folk about my garden, I have gained some useful garden centre vouchers. I also have gained free seed packets from bread bag voucher codes, and won a lovely gardening book in a draw from Green Ideas magazine. If it's free to enter, it's worth a try! 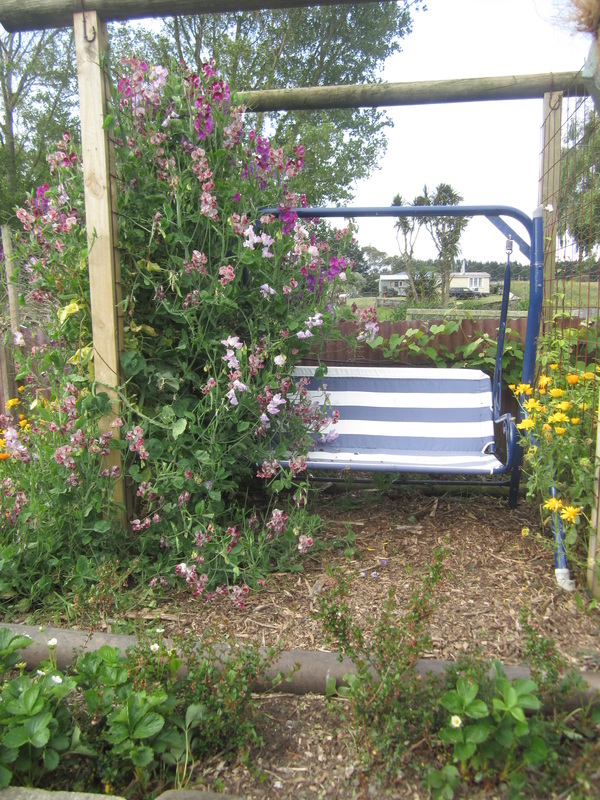 Use Bonus Points: I use accumulated Fly Buys points to subscribe to NZ Gardener magazine and Lifestyle Block magazine - excellent sources of inspiration and information for the homesteader and gardener. There are various schemes around that reward you for things you're doing anyway, such as buying food or fuel, and with a bit of thought they can be turned into more free stuff for the homestead. Above all keep your wits about you, a smile on your face, and your eyes open! There are useful free materials everywhere - you just have to notice, and ask or collect. A smile goes a long way, as does treating other people well - lending a hand when they need it, being kind, sharing what you have. When you treat others well, they're all the more likely to think of you when they have something you might be able to use. Also, most gardeners are a generous bunch - willing to share knowledge, ideas, and seeds and cuttings. If you see something you'd like to grow, or want to know more about - ask! 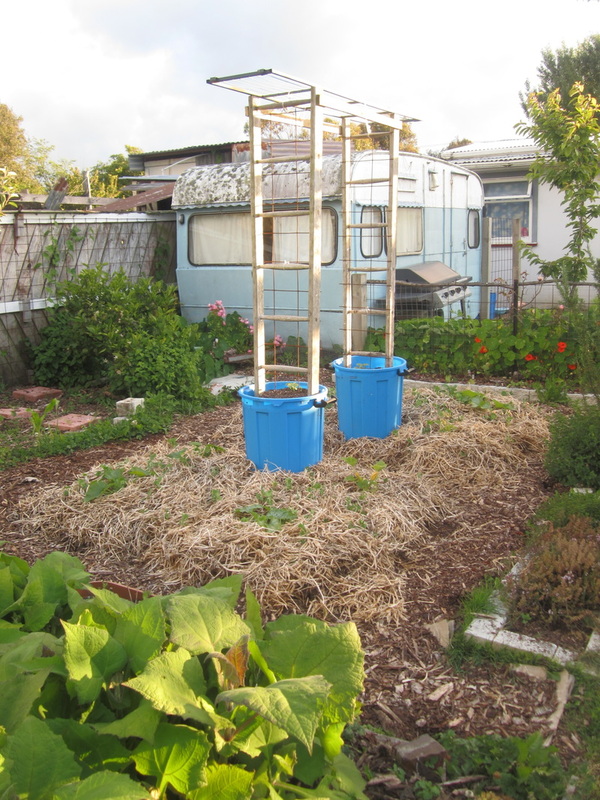 Homesteading and gardening without money is possible - but you do need some patience, as when you can't just go out and buy materials, it can take longer to get things to where you want them. But in the end, it brings greater satisfaction! I went searching for hidden treasure in my garden - those things that might have been growing hidden away, and found three marrows and a small buttercup squash, as well as an unexpected telegraph cucumber that was just hanging around. I picked more cucumbers from the vine in my greenhouse - which has now just about done it's thing for the season; I have left one large fruit hanging on it for seed collection later. I also picked another Crimson Sweet watermelon from my melon bed - one more remains out there, not quite ripe yet, which I now have to provide with frost protection on cold nights. The two pale squash in the middle are Pink Banana Jumbo squash - they didn't get very jumbo though. The plants have died off, so they're not going to get any bigger! I picked a few apples from my triple-grafted apple tree, and a basket of Sweet Banana and Chocolate peppers. 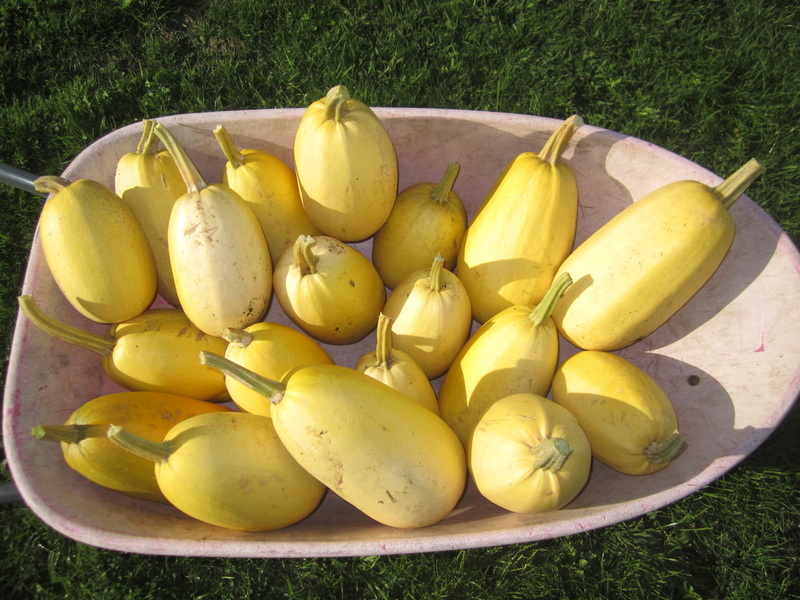 Spaghetti squash - lots of 'em! I have picked 28 ripe squash off 6 wee plants, and there are about another 10 out there still, that may or may not ripen up. To store these, and any other long-keeping squash or pumpkins, I wipe them over with a solution of 2 TBSP white vinegar in 2 litres of water, paying especial attention to the area around the base of the stalk, then lay them out on shelves out on my porch to dry and harden off, before putting them away in a shed on more shelves, ensuring they do not touch. I picked most of the rest of one bed of onions. Look at the size of these beauties! This is my first year growing onions, and I'm very pleased with the results. 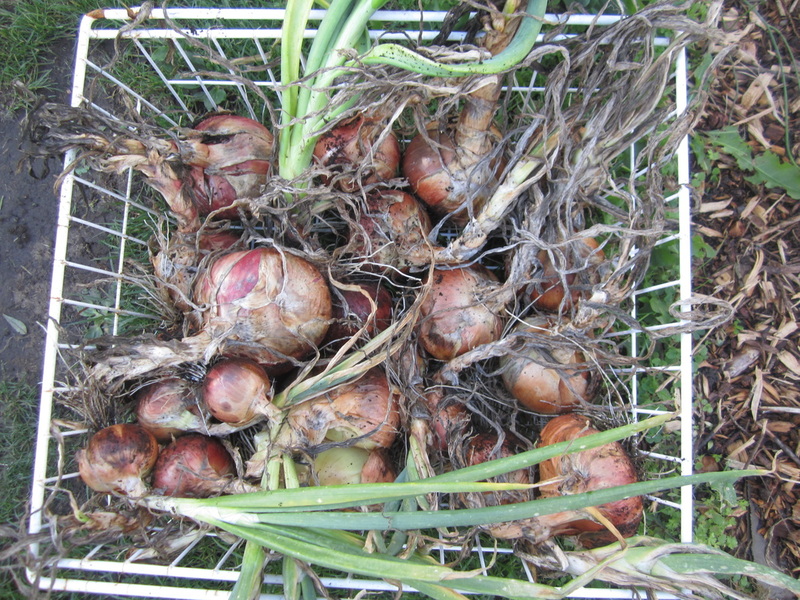 I sowed a tray each of Red Amposta and Ailsa Craig (brown) onions back in August last year. In mid September, I planted out half of them in a fairly newly created bed, which had had compost, topsoil and woodchip mulch added to it. 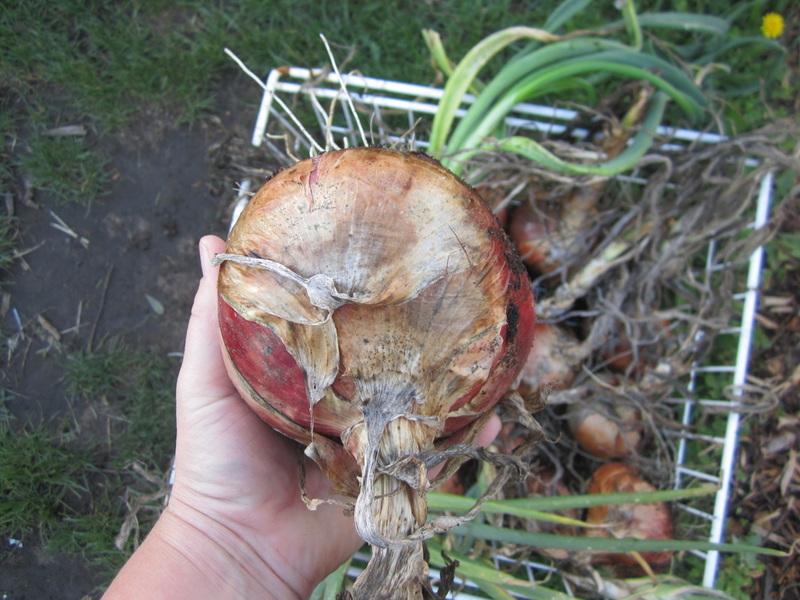 Those onions are still in the garden, and are only small-onion size. I didn't have room to plant out the rest then, so I spread out the remaining seedlings into bigger, deeper trays and plopped them on the floor of the greenhouse, where they were watered fairly regularly but otherwise ignored until I had room for them in an established garden bed which has had regular additions of compost and mulch for a couple of seasons. By the first of December, when I planted the rest out, their roots had grown down into the floor of the greenhouse. I wrenched them out, and then had to pull each seedling out of the tray before popping them in the garden bed. After harvesting, I tie the onions up by their necks to a string which I then hang somewhere airy for them to dry out. For longer storage after that, stacking crates (with holes all around) in a dry shed works well, but mine might not last long enough for that. Must plant more onions!! Fortunately, it's time to sow more seeds. And a crate full of beetroot. In fact, I should have harvested these weeks ago, but I've just been too busy to do anything with them. Now I bagged and froze the best of the leaves to use as a green vege with dinner, and scrubbed and cooked up the roots. When I sliced them, I discarded any woody ones as chook food, and bottled the rest. 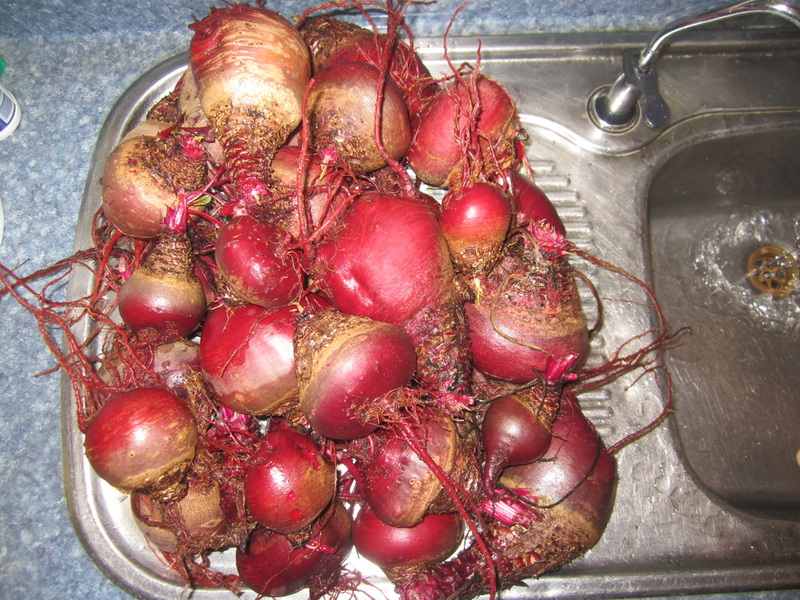 I could have bottled them all, but the woodier ones make ok but not terrific bottled beetroot. Life is just too short for bad food, and besides, the chickens need to eat too, and love the beetroot, either cooked or raw. Full instructions on how to prepare and freeze beet greens or bottled beetroot can be found HERE. 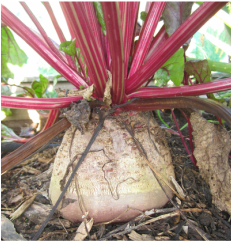 I did leave one really large beetroot in the garden, to go too seed. For seed saving purposes I should have multiple plants to ensure genetic diversity and strength, but this is more an observation exercise - how long it takes, how well the plant stands up to the winds when in full seed-bearing mode etc. I don't actually need more beetroot seed right now - if I do save some, I will mix them with all the other seed I have. 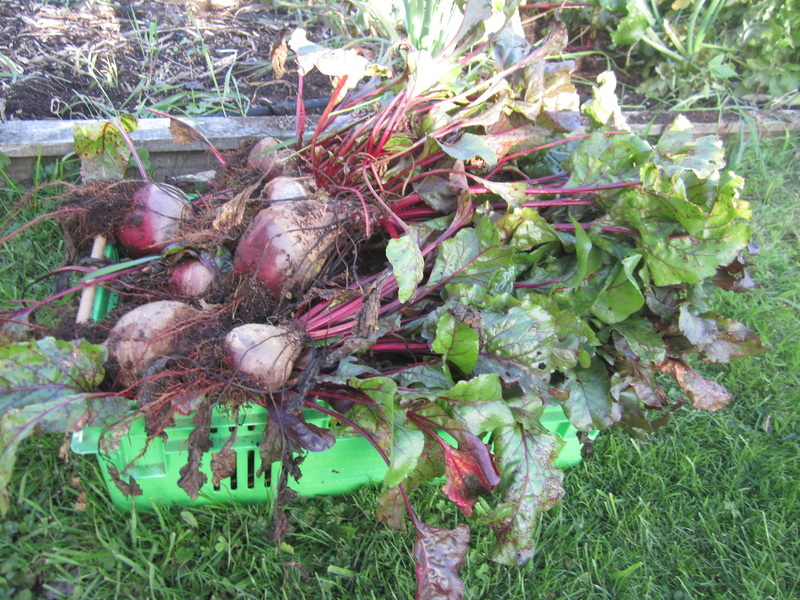 All these beetroot are Detroit Reds from $1 seed packets from the Warehouse, which have done very well for me over the last three years. 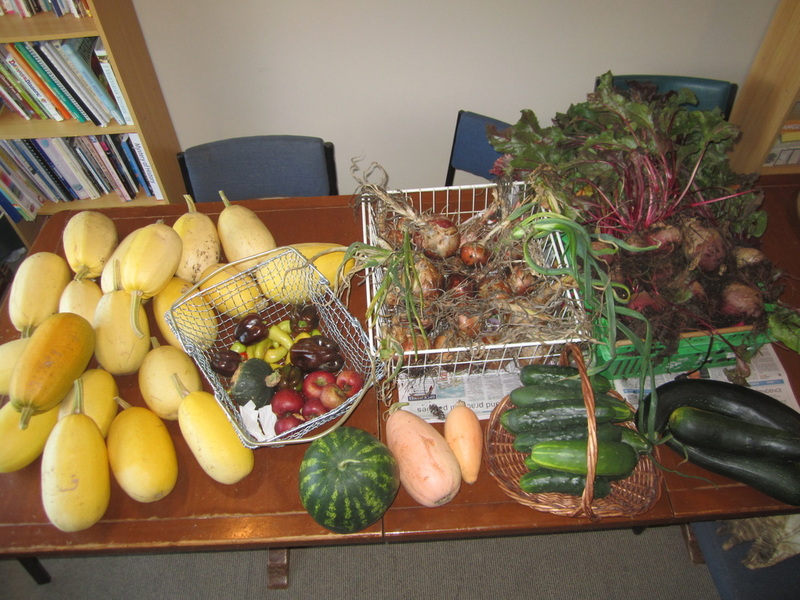 And finally, I picked all the neglected apple & lemon cucumbers which are past their sweetest, telegraph cucumbers which are also over ripe, and overripe melons plus a couple of poorly pollinate corn, and fed the lot to the chickens. They're eating rather well at the moment. I tossed them on the ground then used a spade to roughly cut then open - once the chooks see the seeds and exposed flesh they get very excited! Garden Fresh Salads - even in Winter! 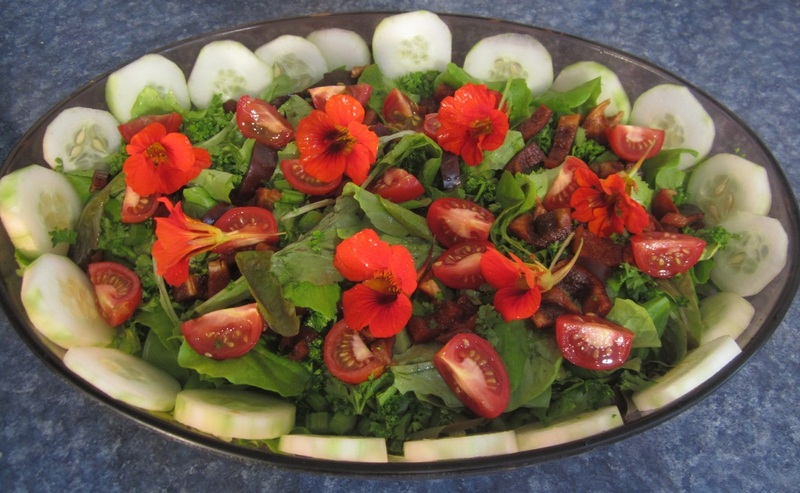 This particular salad is based on mixed baby salad greens, and has parsley, celery, cucumber, chocolate capsicum, tomatoes and nasturtium flowers in it. The ingredients for a salad will of course vary from month to month, depending on what's in the garden, but the good news is that it's possible to have fresh salads all year round, and in fact it's even easier in winter than summer as lettuces and other popular salad greens prefer the cooler weather - lettuce always bolts in summer here. It's wonderful to be able to go out into the garden with a bowl, and come back with the makings of a fresh salad! 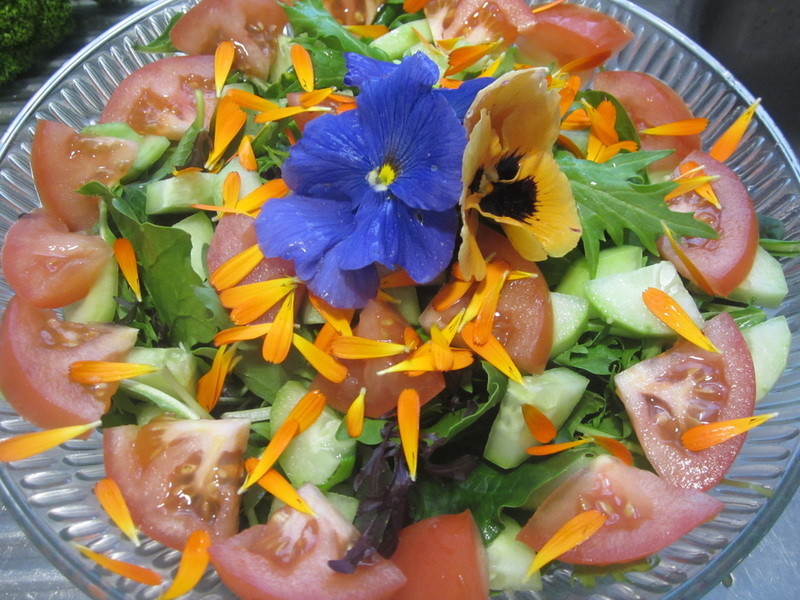 We all know we should eat more raw food, and a hearty salad with lots of variety in it is a great way to do so. What is in your garden that will provide you with salad over winter? It's not too late to plant most of the above items, or too take a fresh look at the things already growing you maybe had never considered adding to a salad before. Another tip to keep in mind - the closer to the kitchen you grow your salad veges and herbs, the more likely it is that you'll actually go out there and pick and use them regularly. So don't put your baby leaf lettuce bed at the far end of the garden - put it as close to the garden as possible! In winter time, leaf lettuce also do very well in tubs, baths or other containers, and in fact most salad ingredients are best picked small and fresh, so can nearly all be grown happily in containers of one sort or another. So whether you have a large or small garden, or no garden at all, there is no reason why you can't grow your own winter salads! Start with a bed or container, filled with suitable growing medium, lightly sprinkled with leaf lettuce seed, finger-rake the seed in, water, and wait for your lovely greens to grow!